The penguin’s name REVEALED and…a Donald Trump game? Cloud Grove is starting to really pick up speed. Most of the design is finished, and now we’re going heads down into implementing the remaining features. 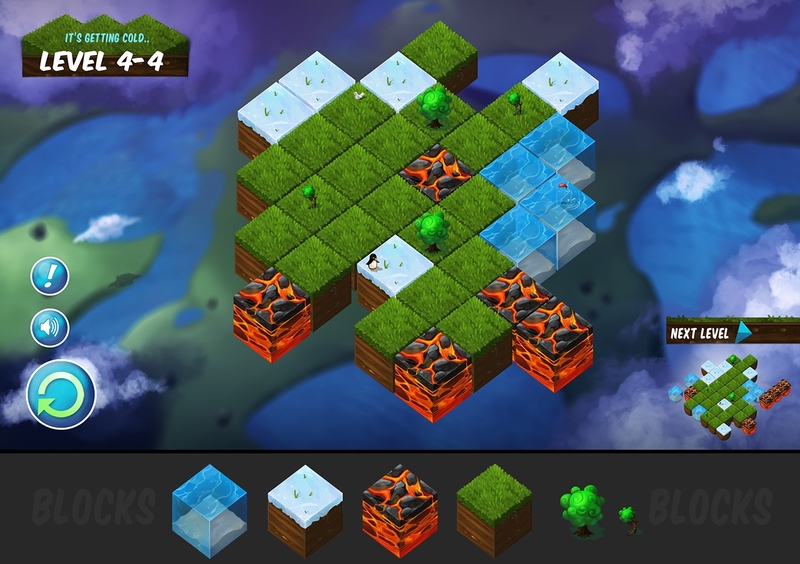 There are a lot of fun blocks coming into play, as well as some interesting interactions on the World Map. The image above is a sample of what we have coming up. I’m pretty excited to see all the levels we can make out of these. Thanks so much jakepeter, we loved it, and we’re going to use it! We’ll have more fan suggestions in the future. Stay tuned! This past weekend was Ludum Dare, an indie game competition where you make a game around a certain theme in 48 hours. The theme was “Shapeshift”, and many of the entries were really impressive. My personal favorites by other developers were Down the Well and Tito’s Revenge. We made an entry around Donald Trump, the current frontrunner for the U.S. Republican candidacy. It’s a parody game where you attempt to mimic the “shapeshifting” Trump has been doing in his persona and personality. I’m personally not a supporter of Donald Trump, but this story has been interesting to me. If you’re interested, you can play the made-in-48-hours version here. I’ll be doing a few updates and posting a version that doesn’t require the Unity Player Plugin soon. Just thought you all would enjoy. 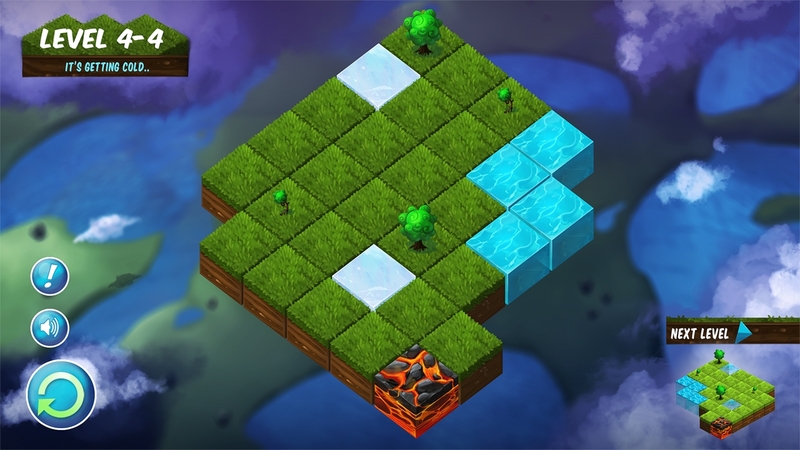 What blocks would you love to see in Cloud Grove? How do you feel about the Donald Trump game? Would you like to see more small games like this? Author Brice MorrisonPosted on April 25, 2016 April 24, 2016 Categories Cloud Grove, Trump Game4 Comments on The penguin’s name REVEALED and…a Donald Trump game? Penguins, twitch, and buried tunnels. We have a lot of exciting things going on at Bromoco Games, so I thought it was worth giving you a few updates! We released Buried back in January on iOS, Android, and Steam. It was great to finally get our first game out. The reception has been in the 4.5-5 stars range across all platforms, which is gratifying. Probably my favorite experience of the whole launch was seeing over 900 people watch Twitch streamer iateyourpie play through the entire game live. The whole thing took 8 hours, which is a crazy long time for people to watch a single game! It was HILARIOUS. I can’t remember the last time I laughed more. If you are ever in need of a good-natured peanut gallery, iateyourpie’s audience is the place to go. So what’s next? I’d like us to do another interactive fiction game eventually, but first I want us to turn back to a game that we’ve made great headway on: Cloud Grove. Cloud Grove is s a very different style of game from Buried, and we showed it off at PAX last year. 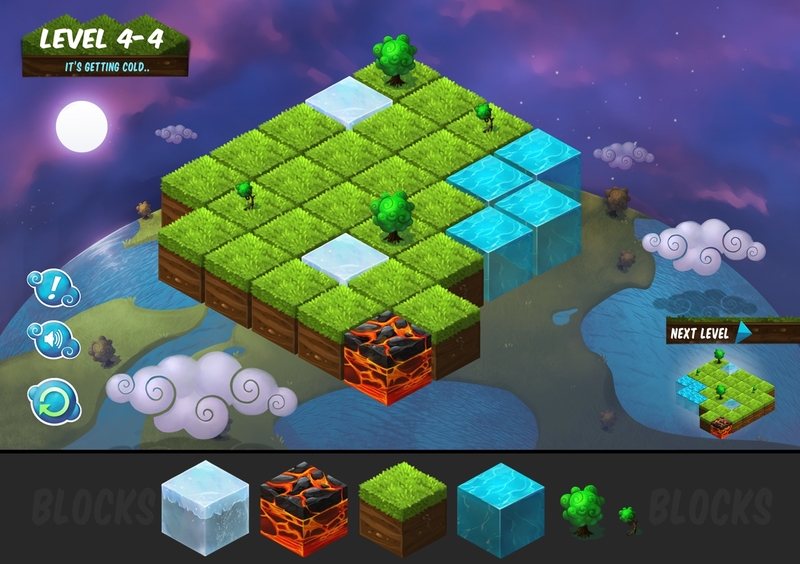 It’s a puzzle game where you try to manipulate nature-inspired blocks. I made a prototype on Kongregate a few years ago called Sky Garden (you can play that for free here). This is a screenshot of a new block type: the Penguin. What does the Penguin do? Well for one he stands there and looks really cool (no pun intended). 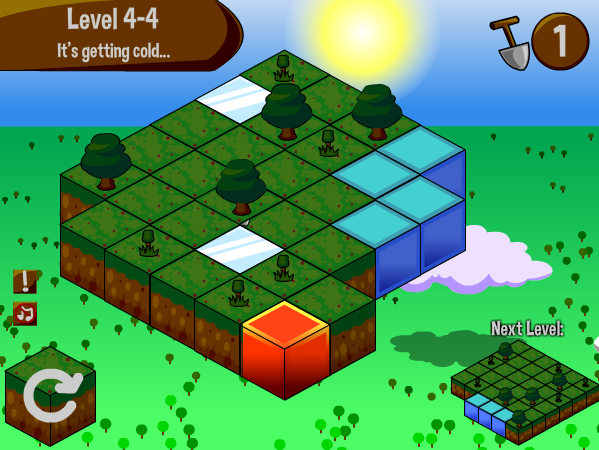 As for his function in the puzzles…you’ll just have to wait and see. Leave a comment with your suggestion! And more importantly: what is his name? Well, that’s also a bit of a mystery right now. We are searching for the perfect name. If YOU have that perfect name, then leave a note in the comments. You could name the mystery penguin! Pro tip: Be sure to give his full name, not just first name. This is his identity we’re talking about here. Leave a comment below, and more updates soon! Buried is now out for iOS and Android, and is on Steam Greenlight! The Bromoco Games team is thrilled to announced the launch of our debut title Buried today on mobile and PC. The interactive dark fiction title is available for $2.99 on the App Store, Google Play, Amazon, and Steam. Go pick up your copy now! We built this story to be made up of stunning photos, a haunting soundscape, and text. The game is inspired by games like The Walking Dead and features branching and alternate story lines based on choices the player makes. They must decide how to approach danger, who to trust, and who lives or dies. Our main character is Roger Hastings, a logger working in the forests of Kentucky with his crew. When he awakens to find his friends missing and no memory of what’s happened, he begins searching, uncovering something that should have stayed hidden. I (Brice) had a blast working with Barry Napier, Buried’s main writer. He’s had his work appear in more than 40 online and print publications. He is the creator of several popular fiction series including The Bleeding Room, the Everything Theory series, The Hollows and The Masks of Our Fathers. Ben our main programmer and Robert our artist have also been great teammates. We’ve gone through thousands of revisions to hopefully create something you all will love. I’m excited to see what you think! Author Brice MorrisonPosted on January 5, 2016 January 5, 2016 Categories BuriedTags android, buried, ios, steamLeave a comment on Buried is now out for iOS and Android, and is on Steam Greenlight! Buried is a playable, interactive story told through gorgeous photos, a haunting soundscape and text. Players take on the role of Roger Hastings, a logger working in the forests of Kentucky with his crew. When he awakens to find his friends missing and no memory of what’s happened, he begins searching, uncovering something that should have stayed hidden. Buried features branching and alternate storylines based on choices the player makes: how to approach danger, who to trust, and who lives or dies. We’ve been working with Barry Napier, Buried’s main writer, has had his work appear in more than 40 online and print publications. He is the creator of several popular fiction series including The Bleeding Room, the Everything Theory series, The Hollows and The Masks of Our Fathers. Author Brice MorrisonPosted on December 1, 2015 Categories UncategorizedLeave a comment on Exciting stuff coming soon…. Everyone is born with a sense of wonder. Children naturally ask questions about the world as they are growing up, why is the sky blue, what is the moon made of, how big is the ocean. Learning something new, something novel, feels good to us. It’s what propels the baby to push a ball, the explorer to sail the ocean, the astronaut to go to Mars. Games are fun because they tap into this sense of wonder. Creating an interesting game world creates new questions to ask and new mysteries to understand. And a big part of this mystery is the game world map, the overview of the world you’re playing in. I played many games as a kid where you could navigate in one kind of game world map, but then you would play the core game in another screen. The maps I’m talking about aren’t seamless “open worlds” like Elder Scrolls or Grand Theft Auto. While those have their place, my favorite game world maps are a layer of abstraction, a village icon represents a larger level of a village, etc. Because of this abstraction, imagination runs wild. A tiny little tile is all it takes to send your mind spinning: “What’s THAT? Is it some kind of weird labyrinth? A magic forest? What is it and how do I get there..?” It made it feel like the game was bigger than it actually was. A level select was one of the most requested features in the original Sky Garden prototype, so it was a given that something will be included in the commercial release. But I wanted to go beyond the boring grid of 1-1, 1-2, 1-3 levels. Instead I wanted to capture some of the magic that accompanied my favorite game maps in other games. An oldie but goodie, one of my favorite world maps is from Super Mario Bros. 3. As you navigated through the Mushroom Kingdom you would constantly see things that you wanted to access, but you didn’t know how. How would you get past this rock? How do I get over to that island? Where does that pipe come out? The map generated lots of compelling curiosity gaps. All of this wouldn’t have been possible if the game was just side scrolling levels. Nor would it have been possible if the world map was just navigation. Rather, the SMB3 team put time and care into making exploring the map fun in its own right. This is why to this day I still refer back to it for inspiration. 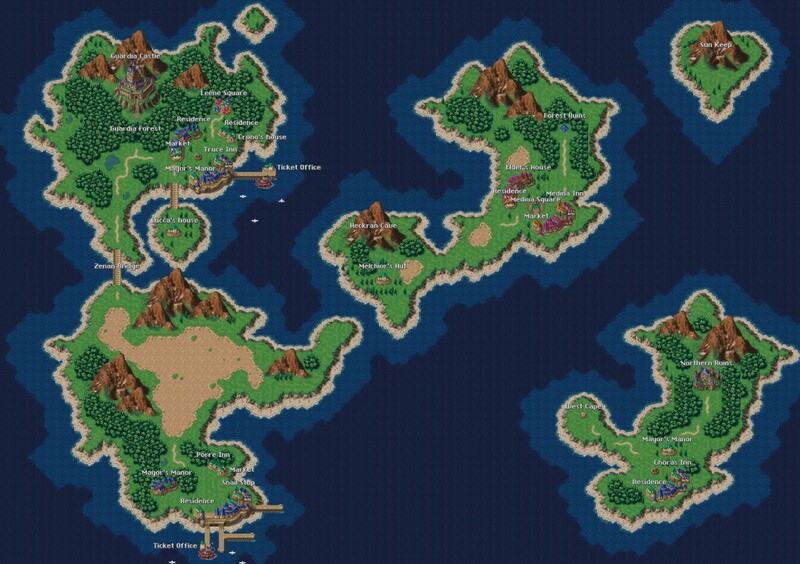 Chrono Trigger was another era-defining game with an awesome symbolic world map. You would walk around with your little party in this large world, and your character size would be much smaller (which felt fun). Same as Super Mario Bros. 3, there were areas of wonder that you couldn’t access. What’s over the Zenan Bridge, and how do I get there? What’s across the ocean? Getting to a new area was always exciting. Additionally since you had to physically walk to an area to enter it, you found yourself poking your nose in all these rocks and trees just to see if there was a hidden location. The element of time changing also provided a huge sense of wonder. When you went to a different time, then it fired off all of these ideas in your mind of where you needed to go check. “Hmm, now that I’m in this era, I wonder what’s over where Lucca’s house used to be?” There was plenty to do, plenty to explore. Even finding nothing would be interesting, because it told a story. “Wow, this area used to be a city, but now it’s NOTHING! What happened…?” This is a great example of a game world map that evoked wonder through tiny symbols. 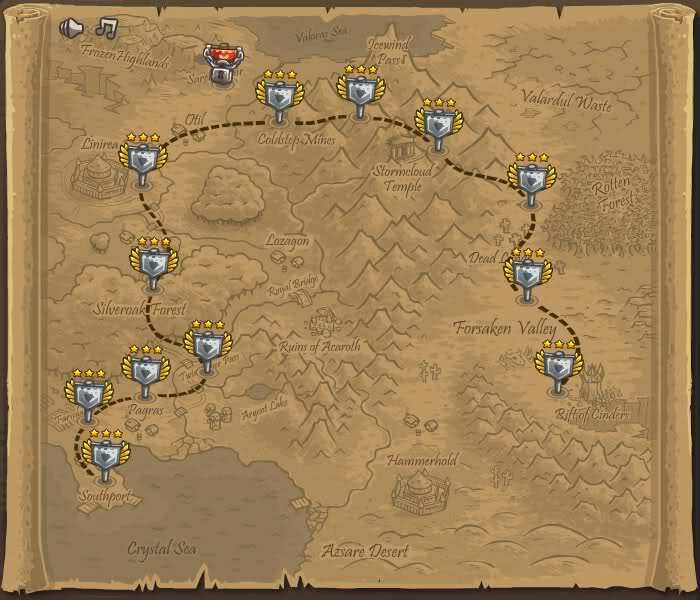 Kingdom rush is a popular Flash and mobile game that also has a fun world map. It’s styled as an old scroll, so you can almost start to imagine yourself as a medieval king plotting an army attack with his advisers. The gorgeous artwork also lets you look ahead and get excited about where you’re going. When will we get to reach Hammerhold? What lies in store for us by the crystal sea? Will we be able to play with that dock? Finally, the map is full of delightful animations. Seagulls fly overhead, soft puffs of smoke pop out of cottages, and if you wait for it, then you’ll see a ship sail out to sea only to be wrapped in giant tentacles and pulled underwater. I laughed pretty hard the first time I saw that. It all gives a feeling that the world is alive and moving. 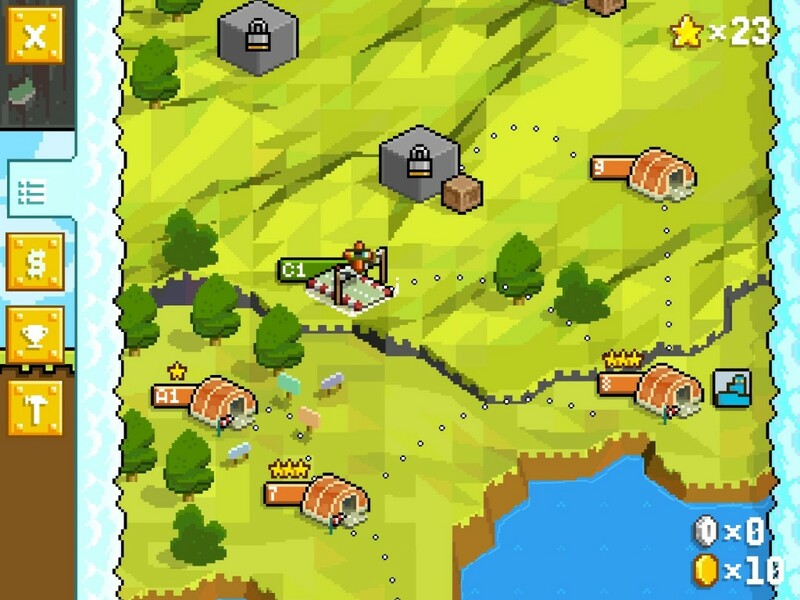 One missed opportunity (in my opinion) on the Kingdom Rush maps is extra elements that aren’t tappable. There are some things that look very interesting, but have no level for you to dive into. This can be a bit disappointing. But overall it’s a fantastic game world map. Retry is a more recent mobile game by Rovio and Level 11 that attempts a throwback to level maps of yore. They had an old school 8-bit style world map, complete with branching paths and fun icons for levels. If you get stuck on one level, then you can just go around it, which already makes it much, much better than a lot of the linear styled mobile games out there today. 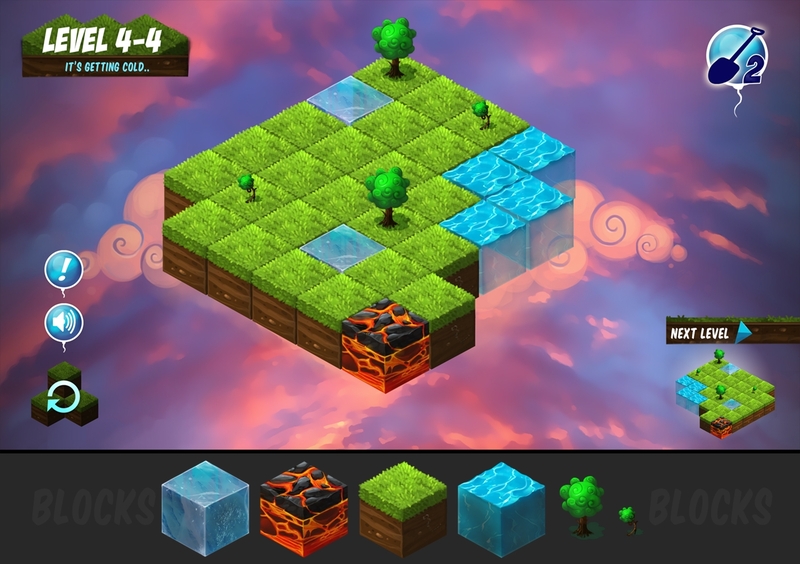 Another fun thing the Retry team did was create different styles of levels. They have “normal levels” but also “challenge levels” and “boss stages”, all of which have their own icons on the map. The first time you see these it’s a real treat – you want to know what’s inside. Retry was a huge influence on me. It was during playing this game that I decided that I really wanted sky garden to have a game world map. So what makes a good level map? It creates a sense of wonder. A good game world map naturally causes the player to ask questions: “What’s that over there?” “How do I get there?” “What does that do?” The journey to answer those questions becomes fun. It allows for easy non-linear navigation. Instead of trudging through a game, you are exploring at your own pace and (generally) your own direction. We’ve had a lot of fun developing our game world map so far, hopefully we can live up to the giants who came before us! How do you discover a game’s art style? For the Flash prototype of Sky Garden I did all the art myself. I did an OK job I’d say, but far from what anyone would expect from a commercial product. So one of the first orders of business was to figure out what our new art style would be. This involves a lot of things all coming together including color palette, shapes we use, rules for how things feel. Is the game “rigid” or “soft”? “Friendly” or “confident”? These were all things that needed to get figured out. I decided the best way to tackle all of these questions at once was to do a screenshot – just a single piece of concept art that has lots of different elements together, that looks like a full playable screenshot from the game, that results in the final art style. After that’s done then the individual assets can be cut up and put into a programmed first version. Here was the screenshot from the original flash game I picked. I picked this one specifically because it has so many different elements for us to figure out: trees, seeds, lava, water, ice, background, everything. I didn’t want us to miss something (lava blocks for example) and then find it’s difficult to fit it in later because the style doesn’t match. From there I started reaching out to different artists and having them work on concepts based on the screenshot. I’ll share a lot of the favorites that didn’t make it in future posts. For this post I’ll walk through some of the decisions that got us to our final art style. Agung’s swirls on the trees are what I think made me fall in love with this. It’s fun, it’s very creative looking, and it’s playful without being too kiddy. Since the game is meant to appeal to puzzle lovers (mostly adults) then these were important. The sunset was also really appealing, but after discussing it with my wife (she is a fantastic “second opinion”) then we decided it actually was too jarring and pulled attention away from the game board. We switched to night time because we thought that it would help calm the scene down (it is meant to be a soothing game) and also bring focus more to the game board. This was a success. The curved earth, however, looked too childish and toy like to me. I wanted the game to look inviting, but not like it was for kids. We also tried doing a bit more separate space between the blocks, which was a good experiment but a mistake I think. We also went heavy on the swirls – I guess I got too enamored with them! I like to think that the best artists understand subtlety, while amateurs are always “in your face”. So we decided to scale back on the swirls in the next version. Another thing that we wanted to fix was the neon green grass. This worked better in the hyper-saturated original image, but it made it, again, look too kiddy and cartoony. This was pretty close, it was all starting to come together. Here we made some final tweaks that really brought it home. First, we had the idea of adding animals – a penguin and a bird. These are so fun in the final piece of concept art that I think we’ll have to add them as a gameplay feature. Additionally we played around with changing the other blocks. Because tapping an ice block will turn it into a grass block, it made sense to have dirt underneath instead of a solid block of ice. Also we came up with the idea of doing sand at the bottom of the water blocks, like you were looking at an aquarium. This really gives it a fresh feel, different from Minecraft or other block type games. And now we have our art style! I made a game prototype recently that got me excited. It was just coded together in Flash, a puzzle game called Sky Garden. First, as a design goal I wanted it to be simple to create levels and content. I had done a game previously that was about 30 minutes of game play time, but it took me about 2 hours to create a level. It was extremely heavy on the custom content. So the goal for this game was to be able to create a new level in about 10 minutes or less. I ended up reaching that goal, it took less than 5-10 minutes to make a new level, since each level was basically arranging a grid. Two, I wanted there to be a correct order that you needed to interact with the gameplay elements. Interacting with the same pieces in the wrong order meant you would lose, while interacting with them in the correct order would allow you to win. When I was prototyping, this was a good way to quickly try and eliminate a lot of ideas for how the system would work. If it didn’t work like this, then I would move on to another idea. Third, my wife had to enjoy it. My wife doesn’t play many games. She played the Sims years ago, she loves trivia and board games, but that’s about it. I noticed a few things about the games that my wife did enjoy: they never involved time pressure, they (obviously) weren’t overly masculine in their themes, and they were “smart”, involving some thinking. So I worked all of these into my design. I was happy with how it turned out, and now I’m developing a new game based on this concept. No name yet, but it’s an all new design, all new art, all new code, but based on some of the gameplay concepts. I’ll be posting my updates here on my blog as things progress! Author Brice MorrisonPosted on February 26, 2015 August 11, 2015 Categories Cloud GroveLeave a comment on Announcing Cloud Grove! Brice Morrison on The penguin’s name REVEALED and…a Donald Trump game? BrianSlug on The penguin’s name REVEALED and…a Donald Trump game? Zach on The penguin’s name REVEALED and…a Donald Trump game?